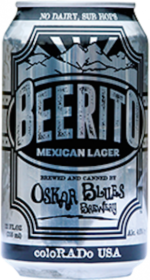 Beerito is an American beer, it has an alcohol content of 4%. Beerito is a light bodied, amber Mexican lager brewed with premium German and coloRADo sourced craft malts and featuring a crisp accent from noble hops. The mouth feel is incredibly smooth with flavors of walnut, toasted bread, plum, honey and cocoa – 4% ABV doesn’t always come with this kind of character.